Public Services International fortnightly news on privatization of public services around the world. Donald Trump has appointed Adebayo Ogunlesi, a top Nigerian business leader who has advised the Nigerian government on privatization, to his “Strategic and Policy Forum.” Ogunlesi is chairman of Global Infrastructure Partners and a member of the board of directors of Goldman Sachs. A United Nations expert has urged the authorities in Nigeria’s biggest city, Lagos, to ensure the 2017 budget improves funding for water and sanitation access for an estimated 21 million residents. “Government reports indicate alarmingly high deficits in the sector, leading to clearly unacceptable conditions for millions of the megacity’s residents,” said Mr. Heller, UN Special Rapporteur on the human rights to safe drinking water and sanitation. Mr. Heller is urging the Government to consider alternatives such as boosting the effectiveness of the public service provider, including by adopting appropriate financing schemes and responsibly reducing water losses. “For more than a decade, the Government has adopted a hard-line policy according to which the solution would seem to only attract private capital, notably via public-private partnerships (PPPs). Numerous civil society groups have urged the Government to guarantee their right to participate in these processes,” the Special Rapporteur said. 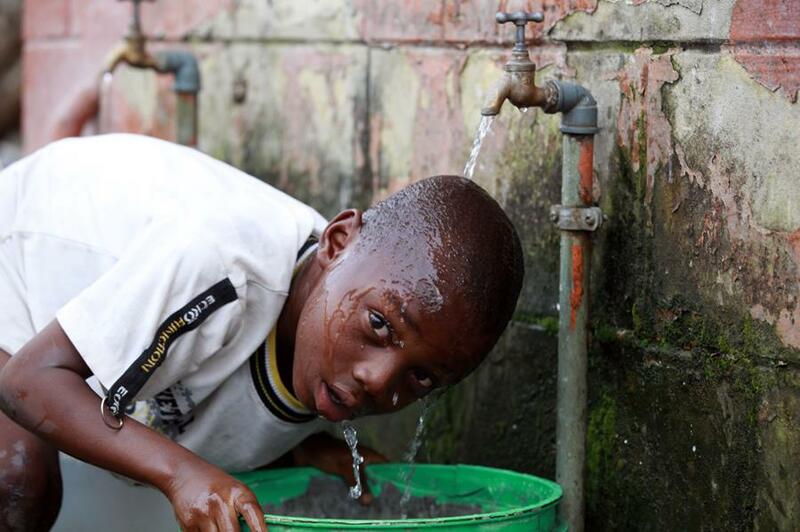 But the Lagos Water Justice Network, comprised of local and global trade unions and NGO’s has laid out a detailed case on the pitfalls of water privatization in Lagos, and is circulating a petition against it. The German “Network for solidarity with Greece” in Germany, has launched a petition calling on the EU-Commission and the German Federal government to abandon their plans for water privatization in Greece. The network is also calling for all written documents to be made public as well as the minutes of oral negotiations between the Greek government and the institutions concerning the transfer of EYDAP and EYATH to the newly founded superfund. All EU member state residents are invited to sign the petition in English – French - German or Greek. The government has just passed legislation that will allow them to lift the cap on aid funds spent through their private equity arm from £1.5bn to £6bn. The bill allows for increases of up to £12bn without new primary legislation. Opposition leader Paul Bérenger supports concerns by trade union leaders that the Trade in Services Agreement (TiSA) now under negotiation will bring the privatization of public services, which the government denies, saying privatization will remain an internal matter. : Public Enterprises Minister Lynne Brown rejects privatization. “Neither I‚ as government’s sole shareholder representative—or our government—will bow to pressure or external lobbying outside of government to privatize any state owned enterprises responsible for delivering basic services to the poor. Especially‚ when it is not government policy. Eskom is not for sale. Koeberg is not for sale. And nor are Transnet‚ which has weathered the economic downtown‚ Denel‚ a Top 100 company‚ or the other companies in the Public Enterprises portfolio‚” she said. In the wake of a budget agreement in which the government yielded to UGTT demands and partially backed off from plans to freeze public sector pay, the Minister of Development, Investment and International Cooperation, Fadhel Abdelkéfi, hints that public enterprises may eventually face privatization, but not now. “The privatization of public enterprises is still a taboo when they are in deficit.The collection of taxes is very low.” Abdelkéfi holds up the privatization of the cement industry as an example. Uganda is in the front line of the global fight against school privatization. “In the developing world, especially sub-Saharan Africa, government agencies and non-government organizations are having some success in pushing back against the edu-vultures. In Uganda, more than 60 Bridge International Academies were ordered closed by the government and courts for failing to meet legal and educational requirements.” Nevertheless, a counterattack against Kenya National Union of Teachers (KNUT) secretary-general Wilson Sossion, who has been critical of Bridge International, has been organised. The Health Sector Workers Network (HSWN) is supporting ambulance officers from First Union, who had 10% docked from their pay for refusing to wear uniforms during a strike action. Kieran Monaghan, a Registered Nurse and member of HSWN, said “This whole episode highlights the deep underfunding of our national healthcare services. Many detrimental health impacts are now presenting from the austerity-like funding structures. These impacts include a reduction of accountable service provision via privatization, a crisis in Mental Health care provision from Primary Care to Crisis intervention and inadequate health prevention and promotion, from healthy homes, to the loss of community based health-initiatives. Some reports are putting the health budget at nearly $1.85 billion dollars short of where we should be… that's the real story here. And if this was not bad enough there are the new legislative abilities employers are able to use to stop workers organizing for better conditions. The Financial Times is saying that President Macri’s “public private partnership” bill “will go very far in rebuilding confidence in Argentina’s legal protections.” The bill, the FT says, “guarantees a more transparent process for considering bids for infrastructure projects, compensation for contracts cancelled by the government, and access to investment arbitration in international courts on a contract-by-contract basis. The bill also aims to increase transparency and accountability by creating a national auditing office to inspect contracts, and a special public-private partnership unit in the government to promote transparency and public engagement.” The legal industry is also pushing PPPs. The National Union of Public and General Employees (NUPGE) has released a report on privatization and emerging threats to public services—New Forms of Privatization. While privatization schemes may be changing, the motivation has not. “Privatization is still about helping wealthy corporations or individuals make a profit at the public’s expense,” said Larry Brown, NUPGE President. SaveOurWater.CA and Wellington Water Watchers are accusing Nestlé Waters Canada and the Township of Centre Wellington of a backroom deal to privatize water—a "scheme that will jeopardize the local water supply." The Council of Canadians has called on the province to expropriate the well from Nestlé and give it to the local municipality. The constitution of Mexico City, which is currently being discussed and drafted, “must prioritize that water is a public, social and cultural good, essential for life, that its management is public or community, and prohibit all forms of privatization,” says the PRD federal deputy Fernando Rubio Quiroz. Opposition to the partial privatization of the Croatian Electrical Company (HEP) is growing. SDP official Peđa Grbin said that the government’s idea to partially privatize HEP “in order to buy MOL’s share of oil company INA” was unacceptable to his party. François Fillon’s planned attack on public healthcare services “will prove a reform too far,” reports The Financial Times. “Mr. Fillon has insisted that, if he is elected, reforming social security will not be his priority. But the mere hint of profound change has caused outrage and dented his approval ratings. L’Obs, the leftwing magazine, ran a front page depicting the politician wearing a medical mask with the headline: ‘Surgeon Fillon seeks to amputate health insurance.’ Criticism also came from Marine Le Pen, the far-right National Front leader who is his main rival, and, worse, from senior figures in Mr. Fillon’s own camp. Soon he seemed to backtrack, erasing the proposals from his website and promising that he would never ‘privatize’ the Sécu.” Fillon has also vowed to cut 500,000 civil service jobs in five years. Divisions over economic and social policy are surfacing on the right wing. “Le Pen's party advocates a protectionist line, while the AfD, although also anti-euro, has liberal economic leanings. The German party backs the privatization of some state services and views competitive markets as ‘preferable to state intervention.’ The dissenters accused [Frauke] Petry of not waiting for party top ranks to give their opinion on the meeting before she went public with the plan to join in” a meeting with FN’s Marine Le Pen. An Oireachtas Committee has been told “the feared privatization of water services was the issue raised most often in submissions to an expert commission examining charges. Kevin Duffy, the chairman of the expert commission, laid out his group's recommendations.” Duffy said, "many of those who opposed water charges and metering focused their opposition on what they regarded as the commodification of water and the potential that this creates for the eventual sale of the water utility." Last November, the National Assembly of Slovenia passed an amendment to its Constitution to include a new article that recognizes the Human Right to Water. The amendment affirms water should be treated as a public good managed by the state, not as a commodity, and that drinking water must be supplied by the public sector on a not-for-profit basis. Should the fate of the Green Infrastructure Bank (or Fannie Mae and Freddie Mac in the U.S., for that matter) be of concern to advocates of infrastructure banks, who insist that such banks will always serve the public interest? “By stealth, the government convinced itself that only a sale of a majority stake in GIB (or the whole lot) would do. But, don’t worry, the government added in a policy paper last March, the other objectives would be value for money for the public purse and an insistence that the new owner should honor GIB’s green purposes. The result is that, by the end of this month, a sale of GIB to Australian bank Macquarie is likely to be announced. We should be alarmed. That is not only because of weekend stories about Macquarie lining up buyers for GIB projects in an ‘asset stripping’ exercise. Investments do not have to be held for infinity, of course, and GIB itself is sometimes a seller. But the real worry here is subtler and more serious: can Macquarie be made to recycle the proceeds of any disposals into GIB-style renewable infrastructure in the UK? The short answer is: no. After a sale, the government is virtually powerless.” [See also, “Aussies plot to asset-strip Green Bank,” in The Sunday Times (U.K.) (sub required)]. Macquarie owns a large stake in the gas distribution arm of National Grid. Subscribe to this newsletter or other PSI publications.